On the scale of 1 to Adore, I really like this book. 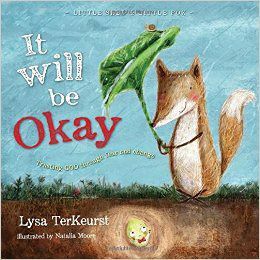 Lysa TerKeurst tells us the story of a seed and a fox who learn to live the subtitle of the book: Trusting God through fear and change. Seed and Fox face a number of changes in the course of the book. Seed’s greatest desire is to stay safe in his packet in the shed, but we know that’s not what seeds were created to do. Fox is pretty much a scaredy-cat. He’s scared of just about everything–except Seed. Together they form a great friendship and learn about the goodness of the Farmer in the process. TerKeurst does a great job of not preaching to little (and not so little people) in the book. She shows how the Farmer intends good beyond imagination for both Seed and Fox–even in “dark, messy places.” I like the way the main characters lives change, but their friendship doesn’t end when their circumstances shift. I really, really like the way the Farmer doesn’t treat Seed and Fox exactly the same in his care for them; he gives each what they need. Bottom line? Buy it! Buy it for your kids. Buy it for the friends they may leave somewhere else in the world. It’s worth the investment. I’m glad it’s going on the bookshelf in my classroom, and it may even find it’s way into a lesson plan!